Christmas is a grand time of drinking, eating and being merry with loved ones. But… whether you know it or not… among us there are people who do not like traditional Christmas pudding. There. I said it – the truth is out! So, for those poor people who have shoveled Christmas puddings into their unamused mouths year after year, we have created these whimsical illustrations and accompanied by delicious recipes for alternative Christmas desserts. Pour the red wine, caster sugar, vanilla and cinnamon into a deep pot and heat on a low heat until the sugar dissolves. 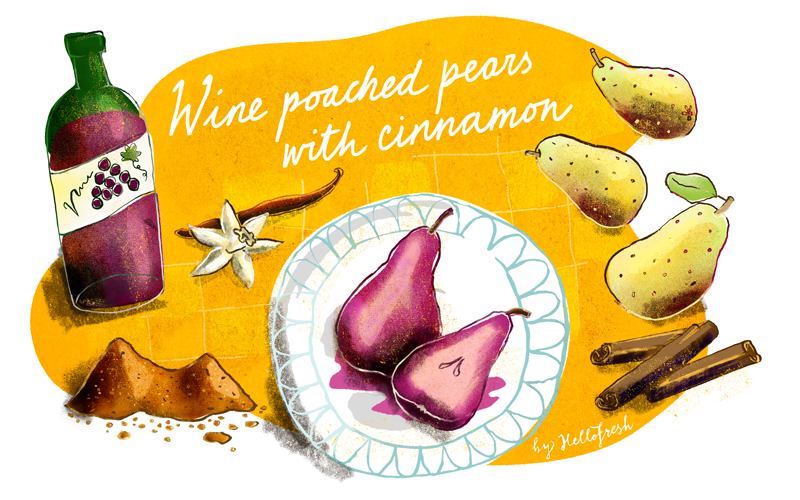 Now, add the pears - they should be covered in wine- then allow to simmer for around half an hour. They should become soft. Take the pears out of the pan with a slotted spoon and boil the syrup for another half an hour to make it more viscous. Cool, then chill for up to 2 days. Remove from the fridge 1 hr before serving. Add ice cream or vanilla cream!